This balsamic and mustard vinaigrette takes less than 5 minutes to prepare, and it makes a fabulous dressing for almost any tossed salad. The balsamic vinegar gives the vinaigrette a sweetness, while the mustard adds a spicy, pungent flavor. When you dress a salad, use just enough to highlight and flavor; don't add too much vinaigrette or the lettuce will be soggy and the ingredients will be overpowered by the dressing. Combine all ingredients in a jar. Cover and shake until well blended. Alternatively, you can use a whisk or electric blender to combine the ingredients. Serve with salads or cover and refrigerate until serving time. Shake again before using. You may be a bit overwhelmed when you look at the grocery store shelves filled with bottles of balsamic vinegar. From the drastic price differences to all of the information on the labels, it can be confusing. Once you learn how balsamic vinegar is classified, however, your choice will become clear. Balsamic vinegar is divided into three grades: Traditional, Commercial-Grade, and Condiment-Grade. In order for a vinegar to be considered Traditional, it must be produced in specific regions of Italy, must age for a significant amount of time, and be made with certain grape varieties. This is the most expensive type of balsamic. Commercial-Grade can be made anywhere, including the United States, and will have color, thickener, and flavor added. Condiment-Grade kind of falls in between—it hasn't been made under the strict regulations of Traditional but has been produced with more time and care than Commercial-Grade. When building your salad, you can use almost any vegetable with this dressing. But don't forget to consider including a crumbled cheese, like blue or goat, and crunchy nuts such as walnuts or chopped almonds. These flavors work really well with the balsamic and mustard in the dressing. This all-purpose vinaigrette is not only perfect for a salad but is also delicious as a marinade for chicken or steak. And after the meat is grilled, try drizzling the dressing over the chicken or steak before serving for added flavor. The next time you make a pasta salad, grab this vinaigrette—it is an ideal match for sun-dried tomatoes, artichoke hearts, fresh spinach, and olives; throw the grilled chicken in there for a complete meal. 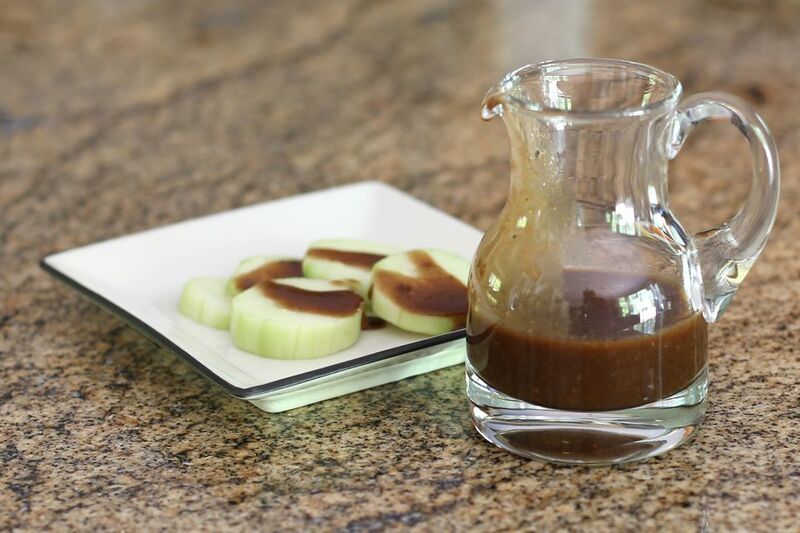 A good quality balsamic vinegar will be rather sweet, but if your vinegar is not very sweet, add a little sugar or brown sugar to the dressing reach the desired taste. For added flavor, sprinkle in a little-dried leaf basil or Italian seasoning to the mixture. You can also include finely chopped fresh parsley.